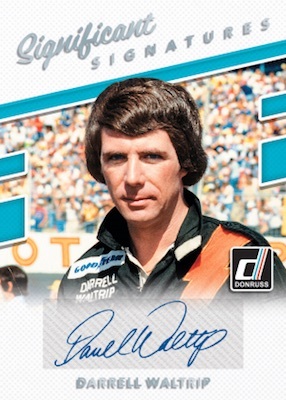 Acting as the more budget-friendly option on the Panini card circuit, 2018 Donruss NASCAR Racing maintains the retro feel of the brand. Collectors can also expect three hits per hobby box, with either autographs or memorabilia cards. While that amount matches the yield of the 2017 product, the prior set specified one autograph and two relics as opposed to the more generic expectation for 2018. Extending the base set are Rated Rookie, Legends and Cars subsets, plus Retro 1985 cards showcasing the classic '85 baseball design. These also come as Variations with changes to the image and/or name on the front of the card. Inserts include a Donruss standard: The Elite Series. Skewing much more rare, and playful, Slingshot! 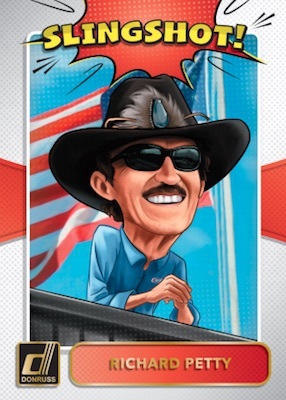 honors legendary drivers with a caricature. 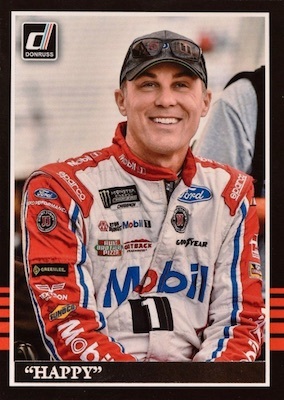 As mentioned earlier, the 2018 Donruss NASCAR Racing checklist is also filled with hits. Retro Signatures 1985 uses the base subset design, while Studio Signatures works with black-and-white images. Significant Signatures identifies some of the all-time greats of past and present, and the Rubber Relics Signatures set combines an autograph and tire piece. The signed Studio, Significant and Rubber Relics inserts also have parallels limited to 25 (or less) and one-of-one. PARALLEL CARDS: Gold Foil #/499, Red Foil #/299, Green Foil #/199, Gold Press Proof #/99, Press Proof #/49, Artist Proof #/25, Printing Plates 1/1. PARALLEL CARDS: Holo Gold #/25 (Whitt #/19;Byron #/23), Black 1/1. PARALLEL CARDS: Holo Gold #/25 (Gant/Petty #/10), Black 1/1. PARALLEL CARDS: Cracked Ice #/999, Xplosion #/99. PARALLEL CARDS: Holo Gold #/99 or less, Black #/10 or less. PARALLEL CARDS: Holo Gold #/99 (Almirola #/75), Black #/10 (Harvick #/4; Patrick #/5). PARALLEL CARDS: Holo Gold #/25 (Allgaier #/10), Black #/10. 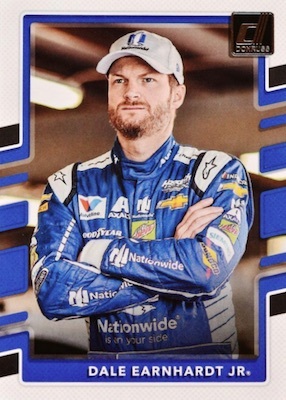 PARALLEL CARDS: Holo Gold #/99 (Earnhardt #/7), Black #/10. PARALLEL CARDS: Holo Gold #/25 (Johnson #/2), Black 1/1. PARALLEL CARDS: Holo Gold #/25, Black 1/1. 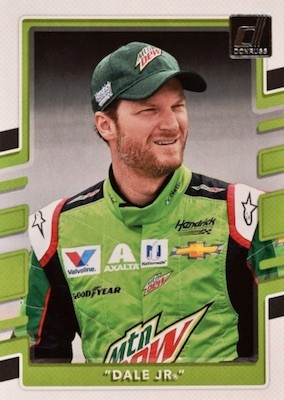 View the 2018 Donruss Racing checklist spreadsheet. I was intrigued with the Slingshot insert set, they seemed like they were going for a non-relic/non-auto SSP insert similar to the “Kaboom!” basketball inserts, but for some unknown reason they’re limiting the checklist to 4 subjects. I really want to see more well designed, well themed, non-auto/non-relic/non-#’d insert sets that are somewhat to very difficult to pull. With the prices of these types from the 90’s selling for crazy prices and the modern single-color box hit relics becoming the hobby equivalent of beverage coasters, it blows my mind we don’t see more products like the recent Fleer Retro sets. They could provide the hobby with much needed variety and collectibility. Great entry level product. 2 hobby boxes complete a base set including variations. Six very nice hits. Little bit of everything for set collectors to collectors that chase the hits. 2018 DONRUSS RACING HOBBY BOX FACTORY SEALED AND FREE SHIPPING! 2018 DONRUSS NASCAR RACING HOBBY BOX BRAND NEW & FACTORY SEALED!